Dressing in something unusual for Christmas is certainly nothing new. Anciently part of Christmas celebrations meant wearing something silly or out of character. That notion continues today with Ugly Christmas Sweater Day. There is nothing meaningful behind this tradition other than fun. 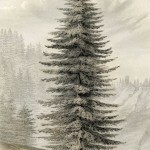 It is universal – meaning anyone can do it – and the only rules are that there are no rules. In fact, the more insane your sweater the better you are celebrating the day. 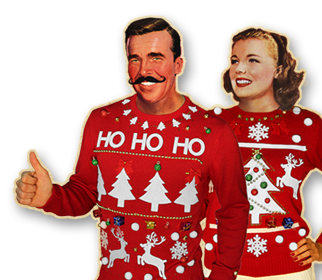 What makes the ugly Christmas sweater so fun is that many of the great Christmas sweaters of the past are considered better ugly sweaters than actual ugly sweaters you can buy new in a store or online. In fact, in a world where things are rated and held up, if there are winners on Ugly Christmas Sweater Day it is those who find something vintage – something that once upon a time was seriously considered nice – and wear it for fun today. While ugly Christmas sweaters can most certainly be worn on Christmas Eve or Christmas Day the great thing about them is that they can be worn “fashionably” any day between Thanksgiving and New Year’s Day. They are worn as theme days in offices all over the world, they are worn in schools and at public gatherings, and they are worn at Christmas parties held any time during the season. But the fun of the season is the one day where everyone is dedicated to wearing an ugly Christmas sweater. This year that day is December 15th – a Friday – and just coincidentally the day predicted to be one of the biggest non-family Christmas parties days of the season. What can you do to be ready? Ugly Christmas Sweater Day is a much more difficult dress-up task than Halloween. It wouldn’t seem so because it’s just a sweater. But finding just the right one – if you haven’t inherited one – can be a challenge. 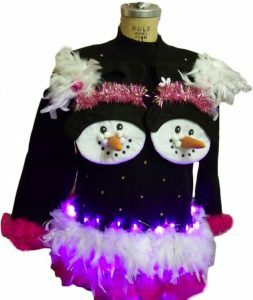 For many people the art of the ugly Christmas sweater begins with a traditional sweater that they then make ugly by adding elements to it. This is what people who theme their ugly Christmas sweater have to do. For example, a friend known for his love of Star Wars spent endless hours shopping for a Star Wars themed Christmas sweater. Instead of buying one he instead found a normal Christmas sweater then he adorned it with Star Wars themed Christmas ornaments. Some folks with more ambitions will take to sewing machines and knitting needles in crafting their sweater. As noted above there are no rules but imagine the horror of showing up at your event either the same or similar idea in a Christmas sweater as someone else. That too, is the beauty of the event. It is one of bold individuality. Beware also that individuality in the art of the ugly Christmas sweater can be costly. It will amaze you how much the ugly costs in many that are available out there – some charging as much as $200 for just a sweater you might wear once a year. 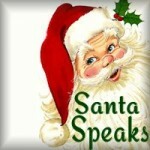 Avoid those once-a-year online shops like tipsyelves.com that exploit the day for profit. Their ugly isn’t nearly clever enough and their pricing could put a serious dent in your other Christmas spending plans. In fact, if you’re going to be authentic you need to seek out a “genuine” ugly Christmas sweater. Some call the birth of the modern ugly Christmas sweater day something that transpired in the 1980s but actually its roots are in the 40s, 50s, 60s and 70s – when the ugly sweaters worn today were actually made and worn seriously for Christmas during those four decades. That means seeking out your sweater in a thrift store or from Grandma’s closet. 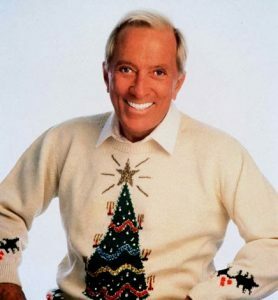 The older the better because the genuine Christmas sweaters of the past were really ugly. If you’re seeking ideas for really creative sweaters check out marketplaces such as Etsy or even Pinterest. And don’t forget: come to the Merry Forums on December 15th and share your ugly Christmas sweater with the Christmas-loving world. It is a day to see and to be seen. What better place to share it than here? I love tasteful Christmas sweaters and don’t find them ugly at all.